Although in stratigraphic terms the Glacial/Holocene boundary is, over much of the world, a clearly recognizable and apparently synchronous feature, this does not imply that the Earth system as a whole experienced an instantaneous and complete shift. Several of the responses to the rapid changes taking place at the boundary took centuries, even millennia to complete. These include processes such as the melting of the polar ice caps, the recovery of global sea level to something approaching its present height, the recolonization of extensive areas by vegetation adapted to changed thermal and hydrological regimes, and the maturation of soils that goes hand-in-hand with increasingly stable vegetation cover where this had been absent during glacial times. Hence it is important to remember that the period was one of transitions and readjustments. There is clear evidence from several quite widely spaced sites for a sudden climate anomaly lasting for several hundred years centered around 8,200 bp. This event shows up as a sharp decline in inferred temperature and in methane concentrations in ice core records from Central Greenland. An almost perfectly parallel change in d18O-derived temperature can be seen in the evidence from Ammersee, in southwest Germany, based on stable isotope analyses of ostracod remains (Von Grafenstein et al. 1998). A growing number of records appear to indicate that this oscillation had a widespread effect. In terms of timing and signature in the Greenland ice cores records, it appears to be in many ways comparable to the preceding, higher amplitude D/O oscillations and some link to rapid draining of glacial lakes in North America and NADW formation may be involved (Barber et al. 1999), but there is also the possibility that the event, especially the methane anomaly, is linked to lower latitude changes in the extent of tropical and subtropical wetlands or the effects of rising sea level. Certainly, the whole of the early Holocene is marked by dramatic shifts in lake level and wetland extent in Africa and Central America. 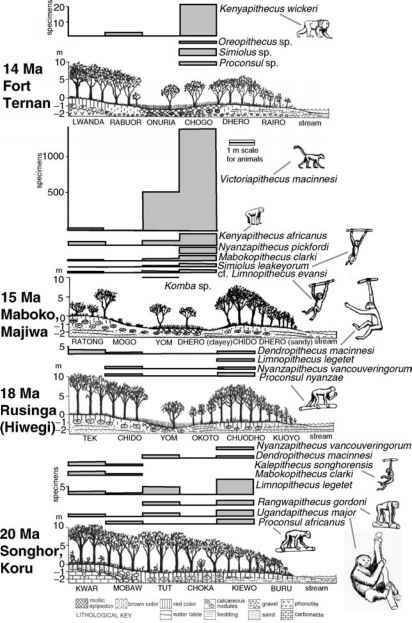 The records of changing lake levels for a range of sites in Africa constitute dramatic evidence of the major changes in hydrology that occurred during the early Holocene. Two examples of such lake level records are shown in O Figure 12.7 (Gasse 2000; Verschuren et al. 2000). Equally powerful indications of variability come from reconstructions of the changing extent of wetlands and vegetative cover in the Sahara/Sahel region and from evidence for high altitude lake level variations in the Altiplano of the central Andes. The dynamics of these dramatic, low-latitude hydrological changes are complicated by the fact that the changes in surface hydrology and vegetation have a strong feedback on regional climate. For example, without including this feedback alongside other forcing, including sea-surface temperatures, it is impossible for existing numerical models to simulate the extent of wetlands and plant cover in the Sahara/Sahel region during much of the early Mid-Holocene (Claussen et al. 1999).